Jeff hunted his first wild gobbler in 1987, a year later he had entered and won his first turkey calling contest. From there he moved up through the ranks and dominated the Wisconsin State competition, winning 12 times since his first championship in 1994. He won the Iowa state in 1998 and 2004, the Midwest Open in 1996 & 97. Jeff’s calling career exploded in 2005 when he won the Mid-America Open in St. Louis, and won the Chicagoland Thunderin’ Open. 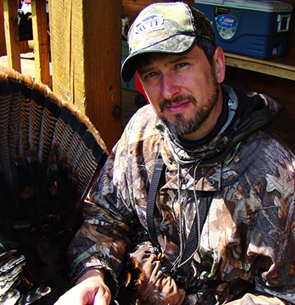 Jeff has competed in the NWTF Grand Nationals 12 times since 1994 with 3 top 12 finishes. Retiring from contest calling in 2010 has allowed Jeff to spend more time with his young family and hunting his property. Jeff has been building his own calls since 1995. Over the years, word has spread about the high quality of Jeff’s calls, also known as the Champion’s Choice line of calls. In 2013, Jeff developed a website which enabled him to take online orders for calls. What began as a hobby has developed into a successful small business. He is known to draw a crowd at sport shows and seminars due to his superior calling and his hunting expertise. At the Outdoor News Deer & Turkey Show, Jeff will be presenting “The Science Behind Calling and Decoying Turkeys”.